Realize your dreams and acquire an ideal boat for your style fishing. Choose from select bass boats, aluminum fishing boats and other fishing boats for sale at boat dealers and outdoor centers in northwest VT. Find aluminum fishing boats, jon boats, bass boats and fish-and-ski models. Also locate dealers and other resources offering inshore, offshore and deep sea fishing boats in northern and western Vermont. If you are looking for a specific type boat for sale, chances are one of these dealers can help. Fishing boats have become sophisticated in recent years. Even jon boats have built-in extras and conveniences to make fishing more fun and less work. 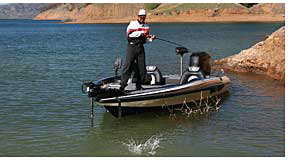 Bass boats are the ultimate fishing machines with fish finders, rod and tackle storage, cold storage, and live wells. Fishing boat dealers are listed based on proximity to cities and attractions. A few of the cities listed include Burlington, Shelburne, St Albans, Vergennes and Waterbury to help you locate one near you. Locate fishing boat dealers and other boat sales locations throughout Vermont by region, within or nearby cities in western and northern sections of the state. Click here to acquire a fishing license in Vermont. Click here to locate resources for boating gear and fishing accessories for your boat. At local dealers, a variety of new and used fishing boats are offered for sale. Whether you want to go deep sea fishing in coastal waters or catch bass and crappie at a local lake, there is nothing quite like the thrill of having your own boat to get there. If you are looking for a place to store your fishing boat in Northwest Vermont, you may want to contact marinas on your favorite fishing waters. Marinas including Malletts Bay Marina, North Hero Marina and Shelburne Shipyard either offer boat storage or can refer you to a resource for storing your boat. Be certain to keep your fishing gear and electronics in a dry, secure storage area.